The Resource Conservation and Development organization acts as a catalyst to help local people protect their natural resources, expand markets for local products, promote tourism, provide community facilities and services, and makes their communities better places to work and live. 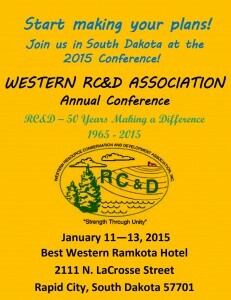 The mission of the South Dakota Association of RC&D Councils is to serve the people of South Dakota by the transfer of information and communicating the identity of Resource Conservation and Development Councils. The vision of the South Dakota Association of RC&D Councils, Inc. is to be a self-governing organization that promotes RC&D’s, shares information by networking, increases community involvement, and provides assistance to councils. Click here to view the photos!